Lately, I’ve felt a little bit underwater. Between a demanding workload, travel (for work and for fun) messing with my schedule, and life starting to feel like it was going faster than I could keep up, I’ve felt unraveled. It’s not a great feeling, but it happens. And when it does, I often spiral into a pit of comfort food and slouching before I realize what’s happened and drag myself out. This week, I’m working on dragging myself out. When I’m feeling lazy or overwhelmed or unmotivated I like to turn to something I know will get me excited. This week I decided to read one of my favorite books, Born to Run, again. About a year and a half ago I read it for the first time and was so motivated and inspired that I started running, seriously. I’ve loved every minute of it… I was always a swimmer and an active person, but until I trained my body to run in a barefoot style, I was never able to run injury free. Watching my body get stronger as I accumulated miles has been amazing. I’ve been running consistently for quite some time, even through bouts of laziness or ennui, but that isn’t always enough. One thing I love about Born to Run is that it focuses on the nutrition aspects of successful distance running as well as the technique. So, after rereading the book on the flight home, I felt a new motivation to delve back into nutrition. Don’t worry, I’ll still be recreating the fried chicken eggs benedict we had in San Diego and posting a recipe for Pi(e) Day. Over the years I’ve learned enough about our bodies and nutrition to know that everything in moderation is fine. But lately it’s been more burgers than arugula, and this week I’m trying to reboot the system. 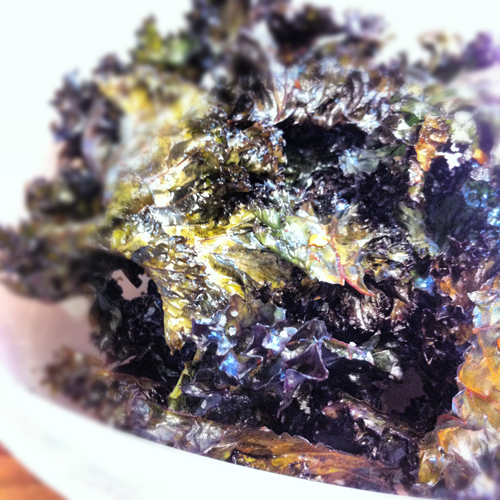 So I thought, as I recover from our (amazing) trip and try and get my head on straight, I’d share a quick and easy recipe for kale chips. I made a huge batch last night and I’ll be snacking away on these all week. 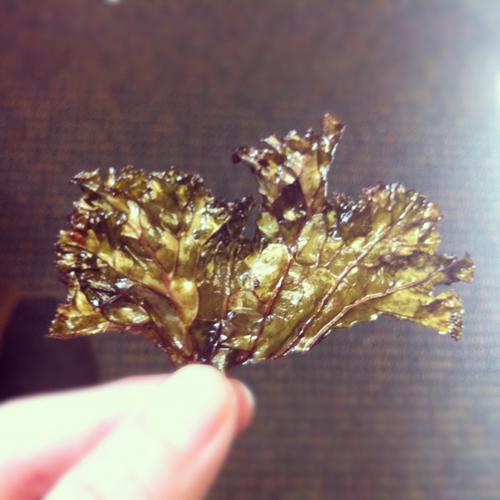 Slicing around the thicker veins and stems, cut your kale down into 2″ squares. Place in a large bowl and drizzle with olive oil. Sprinkle on a tsp of sea salt, a dash of red pepper, and toss. Line a baking sheet with parchment paper and bake at 300 for 20 minutes. 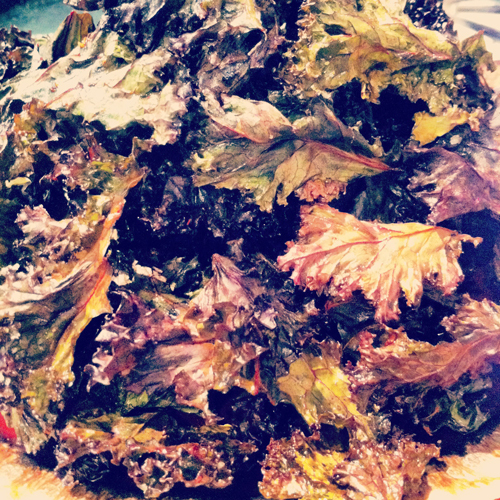 It took me three of four batches to get through a large bunch of curly kale.